John Travolta needs Quentin Tarantino to come and rescue his career again. He's sadly gotten back to the quality of his post-Blow Out / pre-Pulp Fiction period. This is no fault of the actor's. He remains talented and committed. However, like John Cusack, Nicolas Cage, and Bruce Willis, Travolta's career these days largely consists of cheaply-produced, generic pictures that go straight to VOD, save for a token theatrical release in ten or fewer cinemas. Trading Paint is the latest of these. Seeing a good actor stuck with such lazy material is disheartening. Why won't someone give him a great role in a major release again? Travolta plays Sam Munroe, a legendary race car driver. His son Cam (Toby Sebastian) has decided to stop driving for his father and instead join the team belonging to another racer named Linsky (Michael Madsen). That's no small deal – Linsky is Sam's longtime rival. Even worse, Linsky wants Cam to humiliate Sam on the track. Country singer Shania Twain makes her motion picture debut as Becca, Sam's new girlfriend who supports him during this emotionally turbulent time. Trading Paint experiences a major problem right away. The movie feels like it starts in the middle. No proper introductions to any of the characters are given, nor are the dynamics between them shown developing. Instead, everyone has to engage in clumsily-written dialogue to explain to the audience who they are and how they feel about each other. For example, we know that Sam and Linsky are bitter rivals because Sam says that Linsky is his bitter rival. Why are they bitter rivals? Don't ask, because you'll get no answer, just an assurance that they hate each other. There are certainly a lot of dramatic elements – a professional rivalry, a fractured father/son relationship that leads to betrayal, a tragic death (Sam's wife, we learn in flashback, perished in a car accident that he caused), a burgeoning romance, and a high-stakes race. Trading Paint doggedly avoids delving into any of them beyond a surface level. Because we don't get any substantive examination of the tension between Sam and Cam, or of the root of the rivalry between Sam and Linsky, there's no reason to care about any of it. Major plot points are glossed over with hardly any attempt to dramatize them. 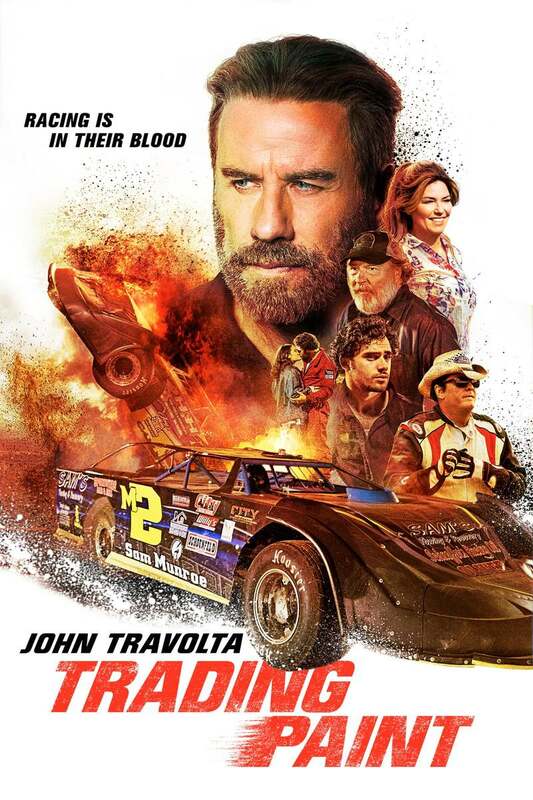 Watching Trading Paint, one gets the feeling that the filmmakers knew they could sell the movie to the racing crowd, but then realized they needed an actual story and thought, Eh, we'll just slap something together. The film only runs 80 minutes minus end credits, so that gives you an indication of how threadbare the storytelling is. Even the climactic car race only lasts two minutes. To his credit, Travolta is trying to do good work here. He strives to capture the pain inside of Sam. Weak material lets him down at every turn. Madsen, meanwhile, sleepwalks through his performance, doing his usual Michael Madsen thing. Twain is utterly wasted. Then again, all the female characters are generic. She and Rosabell Laurenti Sellars (as Cam's wife Cindy) have nothing to do but stand around and watch the men fight. With racing footage as lackadaisical as the plotting, Trading Paint doesn't even work as a sports film. Nothing about this project seems as though it was made with any sort of care, aside from Travolta's efforts. Trading Paint is rated R for language. The running time is 1 hour and 27 minutes.